No Shvitzing in This Outfit! Shvitzing = Yiddish for whenever a person is involved in something that is causing heavy perspiration. Well, today was another boiling hot, humid day! Since it was Shabbat, there was lots of walking to be done (no driving!) so I had to dress for the weather! I like to wear white anyway on Shabbat because it’s a super meaningful thing for my family (here is a bit about it) and today was extra perfect for this. 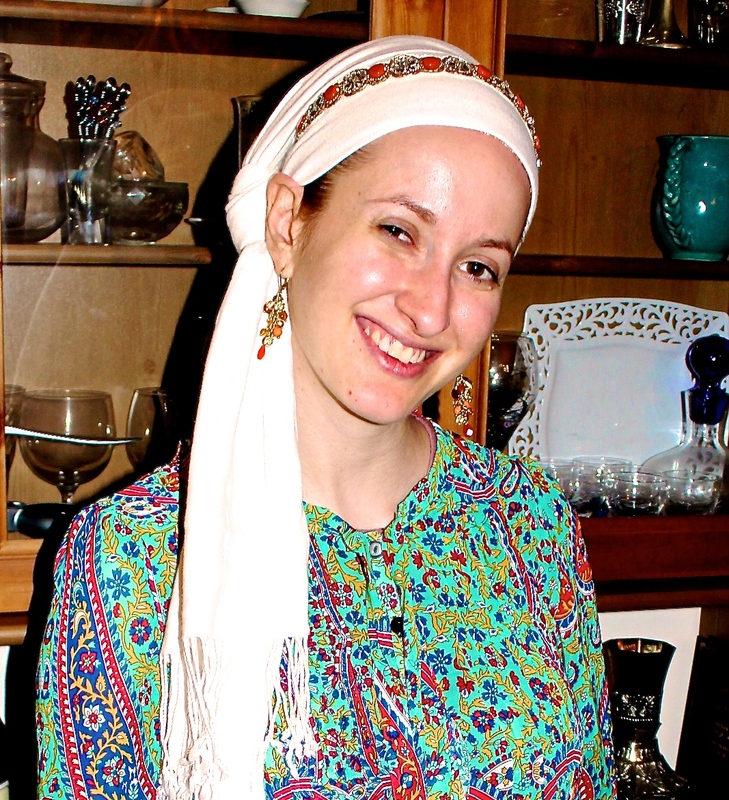 I wore a white Pashmina and Empress Circlet on my head, a colorful summer tunic, and white cotton skirt – loved it! My skin was protected from the sun and the clothing wasn’t constricting so I was really as cool as could be. It’s funny, as soon as I got home and took my tichel off, I was immediately hotter than when I had it on! That was a very big realization for me. And here is my smiling face 🙂 It’s been a long day, but we had an inspiring Shabbat and I can’t wait for this week! Shavua tov, world! ← It’s a Beautiful Signature Day! Love the outfit! Awesome top- where’d you get it?? You look fantastic. I bought the white pashmina for Yom Kippur & added a shimmery then. I love your colorful top. You look so summery. If it works, I’ll post a photo but don’t think I can in comments. If I can, let me know how. I don’t know how to do photos in comments.. hmm are you on facebook? You should post it on the Wrapunzel Fangroup! I don’t do Facebook. So, that won’t work. You wrote you got the top at zulily. Is it online? I always have such a hard time with white. I really like your tunic/skirt combination. That is for the idea and inspiration! Andrea do you just have one tail in this photo? And is the tail at your shoulder brought over from the opposite side? Or is the one side wrapped all the way around, tucked in at the side and then tail looped around the wrapped part to make the knot. I love the look and keep coming back wondering how it’s done. It’s simple but elegant. It’s the same wrap as the Tapestry tutorial (you can find it on youtube) – tie with one end shorter, and just wrap the rest around!